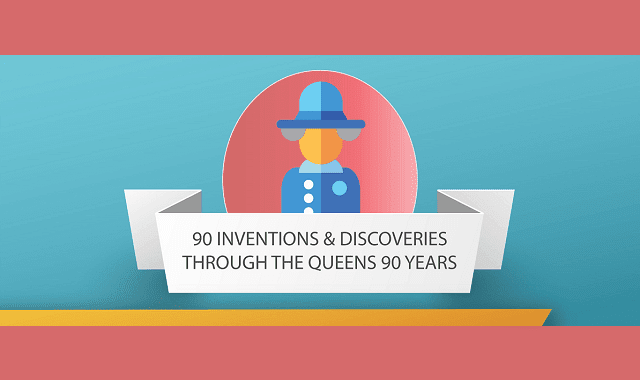 90 Inventions and Discoveries Through the Queens 90 Years #Infographic ~ Visualistan '+g+"
As Queen Elizabeth celebrates her 90th, we looked at how modern life has changed over her lifetime. It turns out emails and smartphones were just the beginning! Have you ever had that moment when you wondered how you used to work before we had emails? Imagine working with no Biro pens, no computers, no internet. Wouldn’t miss those? What about childhood without Velcro, Mars Bars, Blue Peter and video games? Or a hospital that can’t give you any antibiotics or birth control pills because they don’t exist? Imagine domestic life without sliced bread, a microwave and color TV… Don’t even get us started on chill time without Dr Who! Now part of our everyday lives, all these items didn’t exist when Her Majesty was born. Over her 9 decades she has seen our lives not only transformed by technology, but also deeply influenced by it. In our infographic we explore how the Queen has witnessed innovation and technology change British living for ever.